Radiocarpal or wrist joint is one of the most complex joints in our body. It is build up of distal (lower) sections of the two forearm bones and another 7 bones of the hand. These bones are linked with numerous ligaments (which we will cover in the next section) which can get damaged through wear and tear that comes with age, but injury-induced torn ligament in wrist is more common. This is a joint between distal ends of the ulna and radius, connected by two ligaments – anterior (front) and posterior (back) radioulnar ligaments. 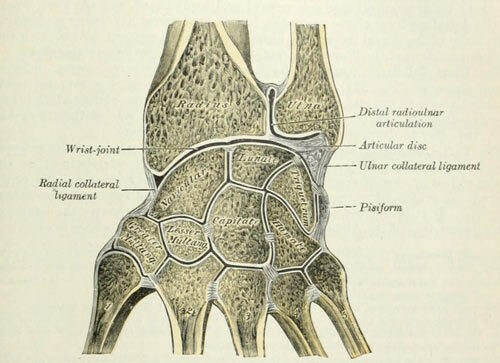 Movement in this joint is fairly limited and it consists of the radius rotating around the head of the ulna. When the radius rotates forward, result is a movement called pronation (thumb is closer to the body) and supination (thumb away from the body). I know that many of you reading this article, are not doctors or medical students and you might think all this anatomy is redundant, but I wanted to help you fully grasp the complexity of the wrist joint. There are so many different structures in this confined space, so an injury can cause a lot of damage, of course, tear one (or more) wrist ligaments. Weaken ligaments may go undetected for some time, because they will present with no symptoms. But, as the time goes by, the damage can add up and result in unstable joints, pain, limited range of motion and complete or partial ligament tears. How To Diagnose A Torn Ligament Yourself? To summarize it into one word – don`t! There is a common misconception in people… they think that you can read a few articles online and become an expert. If that were the case, there would be no need for higher education… The truth is that nothing can replace a well trained expert`s eye, backed up with years of experience, not to mention MRIs and X rays. This is why I always advise people to talk to their doctor, if they experience pain, swelling or any other problem with their wrist. What will the doctor ask you? When did your symptoms started? Is the pain becoming more intense? Have you tried to treat it yourself? Do you think you have a torn ligament in wrist? Next comes the physical examination, and I have to warn you that it may hurt a bit. Your doctor will try to access the severity of the injury, move your wrist to see if there are any problems with the range of motion, how are bones aligned and to pinpoint the exact location of the pain. What Medical Tests Can You Expect? Doctors will usually order an X ray of your wrist – to see whether any bone is broken, and MRI – to see what is the condition of the ligaments and other soft tissues around the joint; they can also do blood tests or an EMG to measure the electrical activity of the muscles. In some rare cases, doctor may even require an arthroscopy. This is a procedure where a tiny camera is inserted into the wrist joint to show the surgeon exactly which ligament is damaged/torn, and can also assist during the surgery itself, to grant a better view of the ligaments that are being repaired. This grinding can lead to arthritis of the wrist. This is a severe condition where the pain can appear during an activity (involving this joint), but it can also intensify after the activity itself, and cause the joints to become stiff. Doctors usually say that accurate diagnosis is the key in efficient treatment, which is 100% true! Why? Well, most people don`t really like going to their doctor. They tend to diagnose themselves and assume injury is not severe: “It`s just a sprain, the ligament is not torn.” Then they rest for a few days (until the pain goes away) and resume with their daily activities. They only visit their doctor after several months, when they start noticing something is not right. As for the treatment, it can be non-surgical or surgical. After the ligament is fully healed, patient will usually require physical therapy to regain the range of motion and strength within the muscles and joints. Surgical treatment is for patients where the ligament is completely torn; it may also be required if the bones are not aligned properly. It is vital that the surgery (if it is required) gets done as soon as possible, before scar tissue forms and bones fall out of their place. There are several surgical procedures that can be done and surgeon will usually choose the best one based on your current situation. Bone pinning is a procedure where the surgeon will insert a metal pin to hold the bones in place, until the ligament is fully healed. This procedure is good for partial torn ligament in wrist, but it needs to be done within couple weeks after the injury, before the scar tissue starts to develop. This surgery is usually performed after six or more months after the injury occurred. The goal of this surgery is to identify the torn tendon and insert a tendon graft (a tendon taken from another place) in its place. Recovery time will depend on the type of surgery that was performed, but patients are usually able to use their hand within the first couple days after the surgery. After two weeks stitches are removed and patients are advised on which exercises to perform and in an effort to regain full mobility. We often take our hip joint for granted; it is massive, and it bears a lot of our body weight, allowing us to walk, move around, stand, sit down and get up. But, just like any other joint in our body, it is susceptible to wear and tear. As the years go by, structures of the hip joint suffer more and more damage until one day you try to get up and feel a sudden, sharp pain. This intense pain is usually brief; it appears after we’ve been sitting for extended periods of time, and it goes away after walking. Another important point you need to take when talking about this short-term hip pain is that it can lead to osteoarthritis, so it is vital that you take it seriously. Before we go ahead and jump to the causes of this condition, we’d like to take a moment to talk a bit about hip anatomy. The hip joint is where the thigh bone (femur) connects to the pelvis. Believe it or not, the hip joint is second most mobile joint in the human body (second only to shoulder joint) because of the specific way it is built. We call this type of joint a ball-and-socket joint because the ball-like top of the thigh bone (femur head) fits into the cup-like area on the pelvis (acetabulum). But, because it carries such a heavy load (our entire upper body) it is designed for stability, rather than a range of motion. The capsule of this joint is sturdy and thick, locked in place by robust ligaments and muscles. Why Do You Have Hip Pain When Sitting? It is important to stress out that hip pain is not normal! Some people acknowledge it as an integral part of aging process, but this is not the case – any time the pain is present, it means something is wrong. The good(bad) thing about hip pain is that it will not go unnoticed. The hip joint allows us to move around, sit, get up or stand, so if there is a problem with cartilage, tendons, ligaments, or bones, it will manifest itself as sharp radiating pain, stiffness in the joint, or referred pain felt in the groin area, down the inner thigh. Interestingly enough, lower back can cause the pain to radiate to the hip. 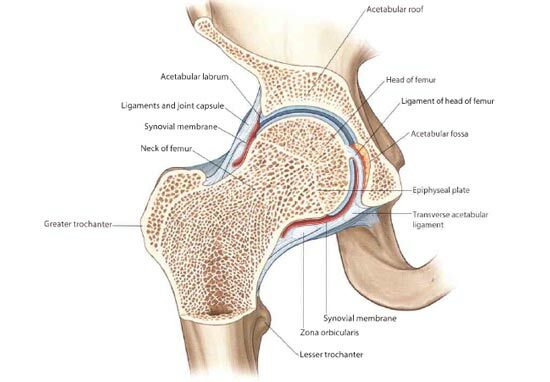 Also called femoroacetabular impingement, it occurs when acetabular labrum(a ring of cartilage surrounding the hip joint – Source: Medicinenet1) is damaged. 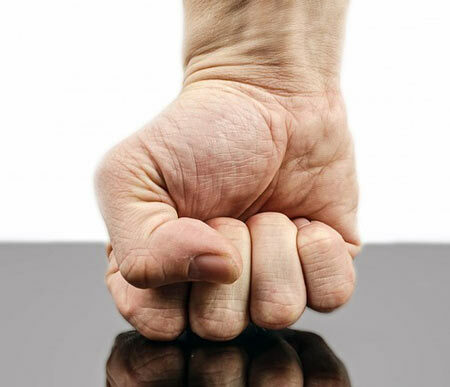 The damage may be caused by a deformity, wear and tear damage, or by a mechanical injury. Many HIS sufferers are those individuals that spend most of their day in the seated position. When we assume this position, there is typically enough space between femur head and acetabulum to allow full range of motion. Increased depth of acetabulum etc. But even people with no anatomical anomalies might suffer from hip impingement if they increase their flexibility to the extreme. This is why a lot of athletes also suffer from this condition – football, hockey, and baseball players for example. Nonsurgical treatment for hip pain when sitting will involve changing your routine – avoiding activities which cause pain, in combination with physical therapy and medication. Surgical treatment usually steps in when physical therapy is not enough to relieve pain. In this case, arthroscopic surgery is required, where the surgeon will make small incisions, insert a small camera (called arthroscope) to try and pinpoint the anomaly and address/remove it. Keep in mind that it is still unknown whether the surgery can prevent or even delay osteoarthritis, there is still some research to be done concerning this issue. Stiffness2 can grab hold of every joint of our body; it is not only limited to the hip. In most cases, this is just a short-term condition brought up by a mechanical injury, such as a hip fracture, dislocation, or tight hip flexor muscles. The main symptom is, of course, a stiff joint, but you will also notice localized pain, limited range of motion and hear a clicking sound as you move. A physical exam is usually enough for a correct diagnosis, but your doctor might need some additional information such as a clear list of symptoms, existing medical conditions, injuries, etc. X-ray and MRI are usually not needed to make the right diagnosis, but they can be used to pinpoint the location of the problem or rule out other, unrelated conditions. Treatment will depend on the underlying cause. In most cases of hip stiffness, a doctor will advise his patient to adopt some light stretching exercises to release tension within the muscles, walk, and rest when the pain appears. Arthritis, on the other hand, is not a curable medical disease, so appropriate medication is prescribed to help patients manage the condition and reduce the pain. Hip or trochanteric bursitis is an inflammation of the trochanteric bursa on the outside of the hip joint. Bursa3 is a small, fluid filled sack situated in places in tissue where friction would commonly occur. So, its main role is a protective one. There are numerous ways of addressing the inflamed hip bursa, depending on the severity of the condition. In its early stages, doctors usually prescribe physical therapy, ice, and painkillers to help reduce the swelling and pain. 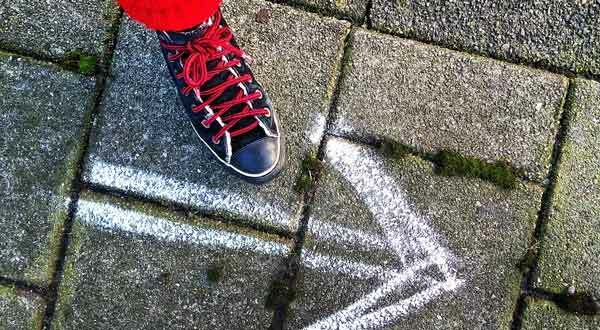 This is why you might feel the pain going away after walking. Doctors will treat more severe cases with injections and bursa draining; if that doesn’t help, they might even use surgery as a last resort. Arthritis4 is a term we use for the conditions affecting out joints and the surrounding tissue. Early signs of arthritis are swelling in the joints, pain, and stiffness; over time, the disease will progress and cause severe joint damage. OA is severe, degenerative disease (most common in hip, knees, spine and small joints of the hand) that breaks down the cartilage in the joints. It is more prevalent in older individuals, people that are obese and often come as a result of a direct injury. OA is usually diagnosed using a combination of physical exams, medical imaging technology, and blood tests. And as for the treatment, the doctor will often prescribe topical creams, physical therapy and exercise and, in more severe cases, operation or even a complete joint replacement (hip replacement surgery). Autoimmune diseases5 occur when there is a malfunction in our immune system. Usually, our immune system protects us from diseases and infection, but in some cases, it can produce antibodies that attack healthy cells and tissues within our own body! Noone still knows what exactly causes RA, but the good news is we can slow down the progress of the disease with medication and lifestyle changes. Gout is also a common type of arthritis occurring when there is an increased uric acid build up in the body. It causes intense pain, stiffness, swelling, and increased the temperature in the joints. Uric acid6 is a substance resulting from the breakdown of purines7, commonly found in meat products. Usually, uric acid gets dissolved in our blood and passed through the kidneys out of our body in urine. Sometimes though, this uric acid can build up within the body in a needle-like crystal form. When these formations accumulate within the joint, they can cause tremendous pain. Gout will first “go after” your big toe, but it can also spread to ankles, knees, wrist, fingers, and elbows. 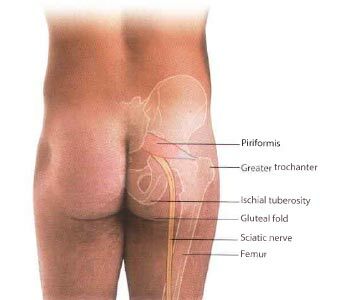 Piriformis syndrome is a condition caused by a comppression to the sciatic nerve by the piriformis muscle. Piriformis muscle is a flat, pyramid-shaped muscle located in the pelvic region. Its primary functions are to rotate the thig outward, abduct it(move away from the midline of the body), and to hold the acetabular head in place. A gap at the lower border of the muscle allows for the neurovascular structures to pass(along with the sciatic nerve). 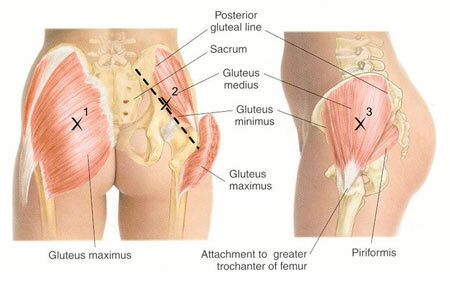 This gap can become tight and put pressure the passing nerves, causing piriformis syndrome. We refer to sciatica as a symptom of one or more problems with the sciatic nerve. We’ve already written extensively on the topic sciatica, to find out more about the condition, please visit our article titled “13 Ways To Get Natural Pain Relief From Sciatica”. Tendinitis8 is characterized by pain, swelling, and stiffness in a tendon and the surrounding joint. A tendon is a thick band of tissue connecting the muscle to the bone. Tendinitis is a common condition, usually caused by repetitive motion; such motions occur in professional sports such as tennis, but may also be found in carpenters and musicians. 2. What Causes Hip Stiff? Sometimes you just want to sit down, relax and pamper yourself! 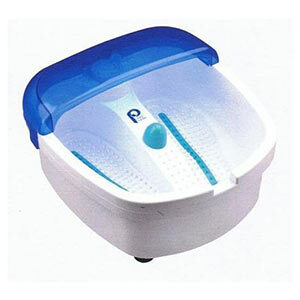 You know what`s good for pampering … a heated foot spa machine with water! Our feet are full of reflex and acupressure points which affect the entire body…so, relaxing your feet will give you a deep sense of relaxation through your entire body. In the following article, we will be talking more about the benefits of heat therapy and recommend some of the best machines you can use to relax your feet, in the comfort of your own home! If you are in a hurry and don`t have time to read, we`ve created a list of the best heated foot spa machines with water (click the link)! In most cases people talk about heat therapy only in the context healing an injury. Sure, heat therapy will be beneficial in relaxing injured muscles or warming them up before physical activity. But can you benefit from heat therapy if you haven`t injured yourself? Another surprising, yet interesting benefit of keeping your feet warm is improved quality of your sleep. Scientists showed that body’s heat regulation affects sleeping. Heating up your legs and feet can help with the body`s heat distribution, help you fall asleep faster and have a more restful night`s sleep. Another huge benefit of using a heated foot spa machine with water is that your feet will absorb essential oils and moisturizers better, providing a faster relief for your painful, sore feet. Reviews Of The Best Heated Foot Spa Machines With Water For 2018! If you`ve reached this section of the article it means you did not click the link we included at the beginning, which is a good thing. Making hasty decisions usually ends up badly. We did give you a list of the best heated foot spa machines with water currently on Amazon, but you might have some special requirements and need more information before you pull out your credit card; which is totally understandable, I would have done the same. In the following few paragraphs, we are going to do just that – not only give you our list of the best foot spas you can use at home but give you all the necessary information that go along with them; this will ensure you have all the necessary data before making your choice. OK, let`s start! Dr. Scholl`s was a renown orthopedic specialist who, during his lifetime, shared over 1,000-foot care products with people all around the world! He started his company in 1904, at the age of only 22 and, not only thrived in this field but produced many innovative solutions back in the day. He died in 1968, but his legacy was kept alive through those who came after him and continues to live on in the makers of Dr. Scoll`s products being manufactured today. 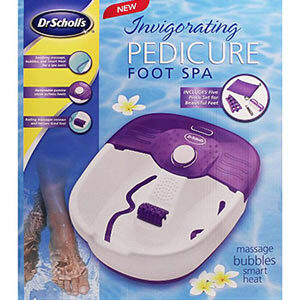 Today, we will be focusing on one of those products – Dr. Scholl`s Invigorating Pedicure Foot Spa. If you look at the price of this product, you will see that it is on the “lower end” of the market, making it a decent budget spa for your feet! As you can see on the picture, this foot spa was predominately designed to appeal the ladies. It is also a bit smaller, when compared to other foot spas out there, for delicate lady feet; that being said, you can also fit in your man feet in there :) If your feet are size 12 (11 British, 46 European or 29.5 cm) and lower, you will fit in this spa, but if your feet are bigger, you should probably look for something a bit bigger. One of the features I really like was the bubbles, it really does help with relaxation even more, especially if you add bath salt… Your feet will get so relaxed, you will want to have it on your feet all the time. And, of course, rolling massagers will work their magic and relieve painful muscles, help them rejuvenate and relax, and help you rid of tension you build up after a hard day. One thing we need to mention, before the final verdict, is the heating “problem.” If you talked to other people, who owned Dr. Scoll`s Invigorating Foot Spa in the past, you will get pretty much the same answer – it`s good, but the heating doesn`t last long. And this is, sadly, true. You need to keep in mind that this is a budget machine, most machines in this price range don`t even hold the water hot half as long as this one. You may get a solid 10 minutes, which is what you would expect. If you want more, you will have to pay more. After all said and done, we have to say this machine is not the worse, but there are certainly better ones. At the end of the day, this is a budget foot spa and costs next to nothing. As we`ve said before, we do not recommend it anymore but if you are interested in buying it, you can do so HERE. This heated foot spa machine with water is a bit more expensive than the model we discussed previously (we are still in that mid to lower range, cheaper category). Why? Well, because it`s better! Only massage – you can use this one in the summer when you want to cool your feet (and yourself) down. Just pour some water and dip your feet! Heating, waves and massage – a killer combo, if I may say so! Massage for deep muscle pain relief and tension relaxation, combined with a therapeutic effect of warm water and soothing waves. This foot spa is also built to be sturdier than the previous one and also comes with three detachable attachments, to give you a “more personal” massaging experience. This is a solid foot massager, ergonomically designed and capable of accommodating people with larger feet. This is a mid-range foot spa and it`s perfect for those who are looking for top quality and functionality, but don`t want to spend top money to get it! 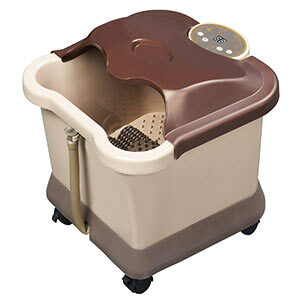 It will relieve tight muscles and relax your feet using two rotating aqua jets with two adjustable speeds. What this means is that you will be able to adjust the massage depending on the sensitivity of your feet. As you can see on the image, this foot spa is quite large so you won`t have to worry about water splashing, spilling over and making a mess. It is also large enough to accommodate your feet. Another great feature, the manufacturer proudly proclaims is that this machine is able to “heat the water instantly,” and heat up the water to 115 degrees Fahrenheit (46 Celsius). First of all, there is really no need to heat up the water so much and secondly, it probably won`t happen instantly, you will have to give it a bit of time… But, this is not a major drawback (at least for me), there is really no need for such high temperature or “instant” heating. All in all, Aqua Jet is the perfect for those of you who want to “dip their feet” and give these sort of machines a try. This is where things get a bit more interesting. We are venturing into those “high-end” heated foot spa machines with water, with the bells and whistles we mentioned earlier. Carepeutic is specially designed to give you traditional reflexology! Reflexology is the application of pressure to the specific areas of your feet (in this case). It is believed that these areas are linked to different organs, organ systems, and our overall health; so, applying pressure to these areas can manifest a beneficial effect on our entire body! You can control the heat of the water via thermo-control which will quickly balance and match the temperature of the water to the value you choose in the control panel. One of the features I like the most on this machine is its dual water jet system which “shoots” out air bubbles to stimulate these reflex zones, we mentioned earlier. This system mimics the hot-tub healing massage and will relieve pain and stress that has accumulated through the day! One thing to note and pay attention to is the depth of this machine. It allows it to cover, not only your ankles but your calves as well. Calves can get incredibly tense, especially if your job requires a lot of walking or you enjoy playing sports/working out on a daily basis. This foot spa machine will relax your entire lower legs and literally take the pain away. Carepeutic also includes built-in drainage valve which makes it easy to drain the water; and (an optional) set of wheels to help you move it around more easily. A while back we published an article titled “Do You Really Need A Back Surgery?” Even though the data used in the article is not that fresh (information used refers to the year 1995. ), a more recent research in the Ohio Bureau of Worker`s Compensation showed that disk fusion surgery performed to relieve/cure lower back pain had an incredible 74% failure rate (you can read more about it at Chiro.org)! Today, we decided to talk about the effectiveness of another kind of surgery – Tenotomy for piriformis syndrome pain relief. Tenotomy is quite different, compared to the disk fusion surgery we mentioned above, and the reason we decided to talk about it is because it has proven to be a fairly successful procedure to deal with pain from piriformis syndrome. Simply put, tenotomy is the cutting of a tendon; it is also called tendon release 1. But why would anyone want their tendon cut? Well, usually because the muscle became shortened and resistant to stretching, or if the muscle developed improperly. In these cases, the tendon is cut (partially through or entirely), to allow the muscle to be stretched. The procedure is usually performed under general anesthesia but in some cases (such as Achilles tendon tenotomy), it can even be done under local anesthesia. The aftercare depends on the severity of the surgery and the patient will usually receive pain medication ranging from over-the-counter pills to stronger, intravenous meds. Good thing about this surgery is that it carries a small risk of infection or bleeding. The study we will be talking about today is a 1 to 16-year follow-up study which involves 19 patients with piriformis muscle syndrome 2. There have been studies describing successful operational treatment but long-term follow-ups (such as this one) are rare. This study was conducted on 19 patients, operated between 1981. and 1997. There were 14 women and 5 men, between the ages of 24 and 64. They all complained of deep buttock pain and posterior thigh pain. All the patients had a tenotomy of the piriformis muscle at the attachment on the greater trochanter (see the image below, ignore the X`s and dashed line). Follow-up showed that 8 patients were relieved from pain, while in others results varied: five had fair while six had poor results. As you can see, the study showed favorable results in more than two-thirds of the patients treated with tenotomy; however, there was a great difference in preoperative duration of the symptoms (1-30 years) and time of the postoperative evaluation (after 1-16 years), which is why this study group can`t be considered homogenous. It is quite difficult addressing the causes of waist pain since waist is the part of the abdomen located between hips and bottom of the rib cage. Due to its location , many of the waist pain causes are linked to the lower back problems, poor posture and lack of exercise. Of course, there are other causes of problems in this area, and we will be going over some of the most common ones in the following text. So, if you want to learn more, keep reading. Lower back pain is the leading cause of problems in the waist area. It is so common, in fact, researchers estimate that there are 31 million US adults experiencing it at any given time! I don`t know about you, but to me this figure is quite alarming, and the first step in fighting it is educating people about it. Single most common cause of lower back pain is an injury, or a blow to the back. There are a lot of different types of injuries, so we will not be going into details, but you should remember that the duration and the intensity of the pain will depend on the severity of the injury. But, rather than estimating and diagnosing it yourself, you should pay a visit to your doctor and he will be able to tell you more. Another common cause is disc herniation. Disc herniation is a condition where the intervertebral disc (tissue located between vertebrae) becomes damaged and slips out of its place and, as a result, starts pressing on the surrounding nerves causing pain. It can also cause numbness, tingling and temporal paralysis. And even though this injury may seem scary and severe, it will usually heal on its own after just a couple months. But, of course, there are cases where it may take up to 5 or 6 months for it to fully heal. Since belly button is located in the center of this region called the waist, it is only logical to mention it as well. Before we proceed, we want you to know that pain around belly button might be a sign of something serious going on, so visiting your doctor is never a bad idea. Depending on the actual cause of belly button pain, treatment will vary. We have an article titled “Good Posture Can Change Your Life” and we advise you to go through it. We`ve explained there the importance of proper posture and the impact it will have on you and your body. Unfortunately, we live in an age where sitting behind your desk for 8, 10 or even 12 hours per day is completely normal. And most of the time, we are sitting in a rather poor posture. We tend to slouch or hunch over the desk, which takes a tremendous toll on our back. Our muscles start to overcompensate, cramp and start to hurt, which may lead to a feeling of chronic waist pain, or at least in the waist area. Muscle spasms are a direct result of poor sitting posture, but can also have many different causes. Basically, muscle spasm is an involuntary contraction of the muscle fibers. 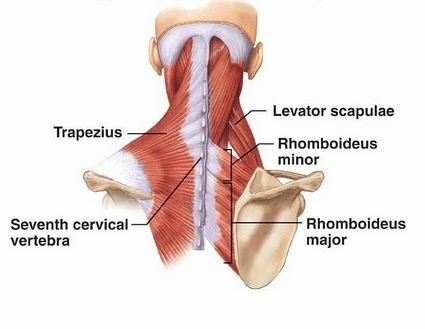 They are most common in the back but can affect different types of muscles around the body. They can be very painful and last anywhere from a couple seconds to a couple minutes. More severe spasms may damage muscle fibers and cause pain for even longer periods of time. The pain is most commonly felt in the lower back, and often described as waist pain by patients. So what can you do about them? Well, not much really. You should focus your attention to prevention – mind your posture, use correct lifting technique (lift with your legs keeping your back straight, don`t bend over), and keep your body well hydrated since muscle cramps may be linked to dehydration. The most common nerve related waist pain cause is sciatica. Sciatica usually manifests itself as pain and tingling in the lower extremity, but the roots of this nerve originate in the lower spine. And if these nerve roots become damaged (compressed) along their path, they can cause pain in the back waist area. A lot of pregnant woman experience abdominal or lower back pain during pregnancy. The pain is commonly felt at the back of the spine, at waist level. Sometimes this pain might radiate to buttocks and spine, so it can be confused with sciatica. In reality, sciatica during pregnancy is extremely rare, and occur in only about 1% of pregnant woman (Source: BabyCenter). This is pretty self explanatory, but we had to mention it. Weight reduction is an act of wearing a corset in order to reduce your waist line. It can cause all sorts of changes, compress your floating ribs and internal organs and cause waist pain. Again, the treatment will vary depending on the cause of your waist pain, but we will leave you with some general tips you can try straight away. Pelvic Tilt – even if you are not pregnant, pelvic tilt can do wonders for your back. You should definitely give it a try. 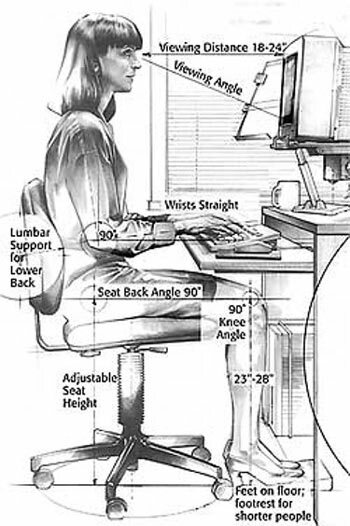 Image credits “Computer Workstation Variables” by Berkeley Lab – Ergonomics, Integrated Safety Management, Berkeley Lab.. Licensed under Public domain via Wikimedia Commons. Having your grasses, googles or any other piece of equipment fog up can be quite annoying. Not only that, your vision can be impaired resulting in an injury! For this reason, we’ve decided to cover this topic today; we wanted to give you a better understanding of why the fogging even occurs, what can you do about it, how to prevent it and, of course, what is the best anti-fog spray you can use to clear your lenses! Your glasses fog up due to water condensation. As we exhale, water vapor comes out of our mouth and comes in contact with the lenses. Lenses then cool down this vapor and turn it into a liquid that fogs them up. Watr condensation is a part of the process called phase transition. Phase transition is a process where a substance (in our case, water) changes from solid, liquid, or gas state into a different state. This change occurs as a result of a change in temperature. How Can You Keep Your Glasses From Fogging Up? If you are wearing glasses, you should prepare yourself for winter. Buying a pack of good anti-fog wipes(or a spray) is a cheap, quick fix if you are not looking to spend a lot of money. And if you are dirt cheap, you can also use your saliva or your breath. Spitting directly on your glasses is, fortunately, entirely unnecessary. You can just put some saliva on your finger, rub it across the lens and use a wipe(or your shirt) to wipe it all off. The best solution to this problem would be to invest in a solid pair of glasses with an anti-fog lens. Investing in a new pair of glasses may require a bit more money, but it will take care of your problem permanently. Shaving cream is a quick fix that has been around for as long as I can remember. What you need to do is just to use a tiny dab of shaving cream and smear it across the lens. Let it dry out and then polish it, using a clean cotton cloth. The end result will be impressive and it will last for some time. Applying soap is pretty much the same. Making your lens water resistant by using a water repellent spray is another effective way of preventing them from fogging up. The only problem is, anti-fog sprays for glasses are relatively small in size, so you can carry them with you wherever you go; this is not the case with water repellent sprays, which are usually larger. Choosing a pair of glasses that will sit further away from your face can take care of the fogging up problem(if it was caused by your breath). Also, removing them from your face and storing them your pocket for a couple of minutes, will warm the lenses up and may prevent that phase change we talked about earlier. We have to say that, during our research, none of the products really “popped.” There were only a few that we found to be promising, which we will mention in the following paragraphs. That being said, our top advice would be to invest in a pair of anti-fog glasses/goggles. You can find some good deals on Amazon by clicking here. Another route you can take is to buy wipes. You can find them here. This one proved to be the best one we’ve come across(it is also Amazon.com’s top choice), it is long lasting (approx 200 pumps), contains no toxic chemicals and it will work for both glass and plastic. Now, these sprays are mostly for your everyday, regular use. Though they are advertised to be used in water as well, they have not performed the best. You can always give them a go, they are relatively cheap, won’t put a dent in your budget, and will help you keep your lens clean. You’ve noticed this product is made by the same company as the previous one. It also contains no harmful chemicals and is meant for both glass and plastic. The only difference we’ve noticed so far was the fact this product works better in water than the previous one. Though there is a disclaimer saying “It is not meant for water goggles,” it performs well in the water environment. This product is more geared to divers and those individuals who want to coat their goggles, though you can use it for your glasses as well. It is formulated to be alcohol and toxic so it won’t damage plastic or rubber parts of your equipment. It is made in the US and it comes in a package of three bottles, so it will have you covered for months to come. You can choose yourself, but we found that spray offered the most “bang for the buck” as it will outlast the other two. Though this product is advertised only for glasses and scopes, you can just as well use it for your goggles. Just make sure you rub it on the inside of the lens prior to wetting them.